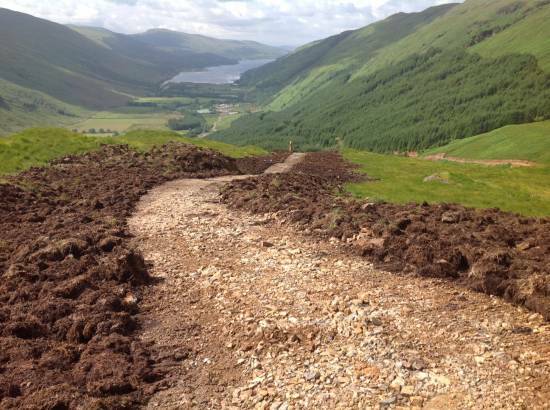 The work has now been completed on the South Leats. All aspects of on-site construction are now complete including leats, intakes and the header pond. SHEPD and Kestrel Controls are on site today (3rd August) to carry out the G59 test on the turbine. On successful completion of the test the turbine will be exporting power to the national grid. Over the course of the next month, there will be a period of fine tuning carried out by Kestrel Controls and CRF Hydro Power whilst the generator runs with restrictions. Connections to the communications network are ongoing with the remote monitoring setup to be active later this month. All temp access tracks now in place. Reinstatement of tracks progressing to areas where work complete. This includes primary penstock, secondary penstock and secondary access track to Header Pond. Roof and slating complete. Block work walls 100% complete and natural stone to face external block work 50% complete. Pigging chamber and thrust block to penstock 100%. Windows and doors fitted and internal decoration to walls (white paint) underway to allow electrical installation to commence on Monday 24th November 2014. Outfall headwall in place at side of River Fyne. BT connection has been ordered for Power House. Turbine and generator on site in power house and fixed into position by CRF. Kestrel Controls Ltd to commence with electrical installation work on Monday 24th November 2014. 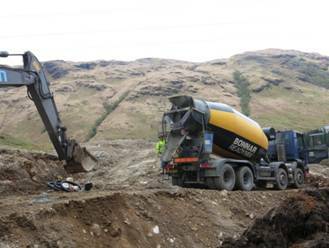 Site meeting has also been arranged for Monday 24th November 2014 with SSE Project Manager to discuss work/timing of connection to grid once Kestrel Controls Ltd have completed their work by end of 2014. Primary penstock 100% complete. Thrust block at intersection of plastic and ductile now being installed. Additional thrust block was detailed/construction on lower section of primary penstock about 50m uphill from power house. Primary Penstock to be tested early December 2014. 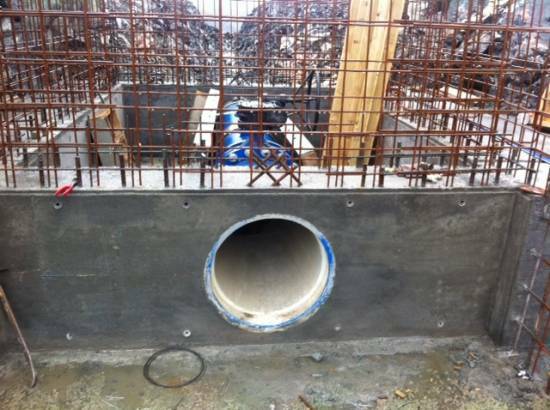 Secondary intake installation (drop-box) completed by CRF and pipework from drop-box to header pond complete. Secondary Penstock backfilled and reinstatement work to track complete. Header pond 100% excavated. Concrete wall to North 100% complete and outlet structure to South 90% complete. Works to outlet structure will be complete by end of November 2014. Once this work is complete water will be diverted to slowly fill pond in stages. Reinstatement work to earthworks around header pond has commenced. Work in relation to the North Leat is progressing with the route approximately 95% complete through some very challenging ground conditions. Foundations excavated and now complete. Steel work has been erected to superstructure of power house and concrete blockwork to walls complete. Timber roof complete and slating to roof has now commenced. Windows and doors on order and should be on site and installed by mid-October 2014. Thrust block and pigging chamber at power house 90% complete. 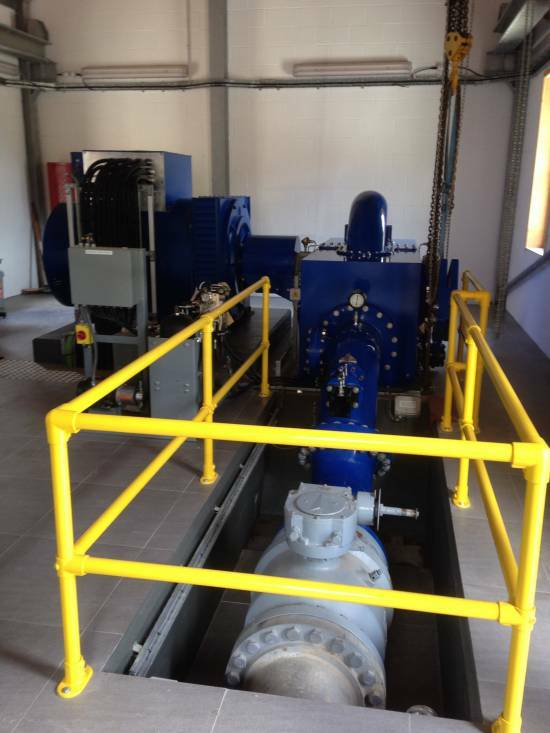 Turbine and generator on site and installed in power house. Pipework through floor being concreted in and left to cure for 28 days prior to turbine being connected. Kestrel Electrical Engineers have been appointed to manufacture and install the electrical control panel system and design information has been produced to enable power house construction drawings to be complete. SSE have approved all contestable works in relation to proposed design and installation of the transformer and control system and equipment in relation to transformer has been ordered and secured. Programme of works being agreed with Kestrel. All pipeline has now been ordered and secured with secondary pipeline now welded and ready to install into ground. Pipeline for North Leat System also now on site. Primary Penstock now excavated into ground with last remaining section to outlet dam to be finalised by end of September 2014. Primary penstock 99% complete with just last section to header pond to be backfilled and final joint made to outlet dam. Thrust block at intersection of plastic and ductile to now be installed. All pipework jointed and excavation work to commence w/c 29th September 2014. Drop box for secondary intake supplied by CRF and being installed in burn. Header pond 100% excavated. Concrete wall to North 100% complete and outlet structure to South 85% complete. Works to outlet structure will be complete by end of September 2014. Once this work is complete water will be diverted to slowly fill pond in stages. 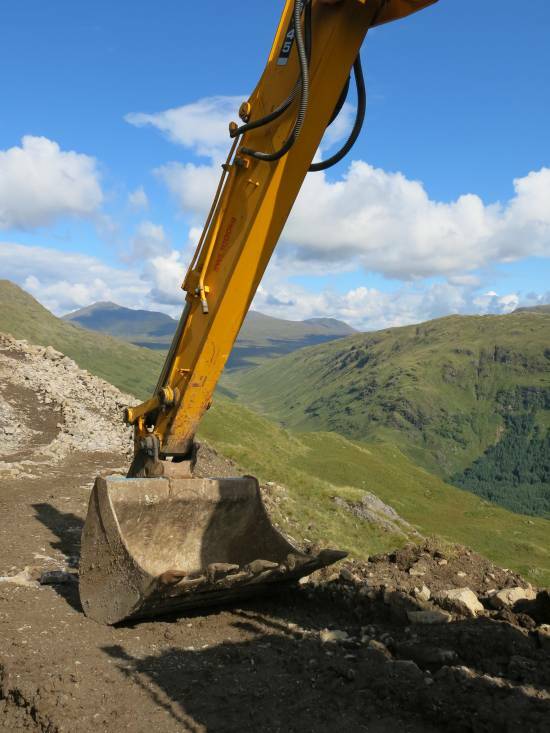 Reinstatement work to earthworks will commence October 2014. Work in relation to the North Leat is progressing with the route approximately 90% complete through some very challenging ground conditions. Work to the South Leat will commence in the Autumn of 2014. This picture shows the first section of the road constructed after the pipe has been laid. The road has been narrowed, landscaped with earth on the verges resulting in a much neater appearance. The construction access tracks up the length of the main penstock to the header pond and onwards to the North Leat system have been 90% complete. This work has proven that full access can be gained through the site with some difficult ground conditions (rock) that have been overcome. Turbine 90% complete and arranged to be delivered to site August 2014. Kestrel Electrical Engineers have been appointed to manufacture and install the electrical control panel system. SSE have approved all contestable works in relation to proposed design and installation of the transformer and control system. Primary penstock installed about 35%. Ground very hard with rock in most areas. Concrete thrust blocks being installed where required. Header pond fully excavated and construction of overflow wall 50% complete. Once overflow wall complete outlet structure will commence. Work in relation to the North Leat is progressing with the route approximately 75% complete through some very challenging ground conditions. Work to the South Leat will commence in the summer of 2014. Work has commenced on the foundation and construction of the turbine house during April 2014. The primary penstock is also being installed from the turbine house to the header pond with approximately 35% complete to start of May 2014. The excavation work at the header pond is now complete and construction work has commenced on forming the overflow and outlet structures to the header pond, both which will be formed with reinforced concrete then landscaped with earth once complete. 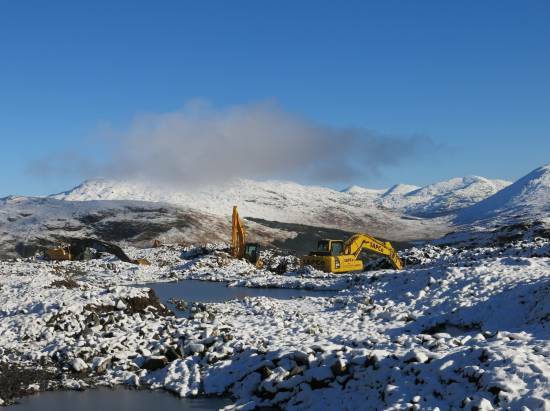 All pipework for the primary penstock is on site and turbine due for site delivery July/August 2014. 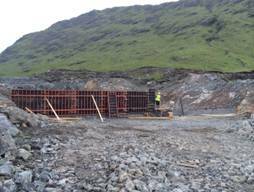 Work progressing well with progress concentrating on the construction of the turbine house, installation of primary penstock and construction of header pond. Work has continued at the header pond including the excavation of the north leat system. Initial work to prepare the power house site at the bottom of the hill has also commenced with concrete work to the power house foundations programmed for March 2014. 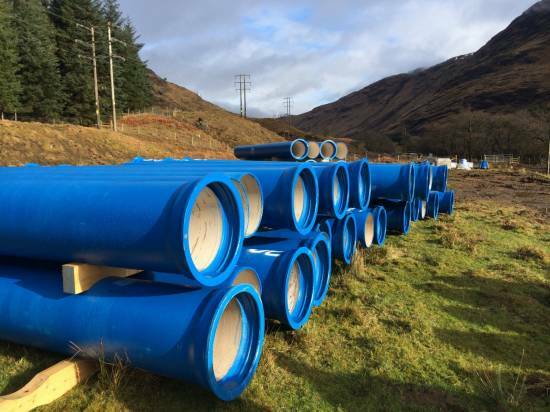 Initial deliveries of the pipe work for the main penstock have started to arrive on site. These wll be deliverd to a number of pipe station along the length of the main penstock. The manufactor of the turbine is progressing well with delivery still programmed for July 2014. The turbine runner is currently being forged by Canyon in the USA. 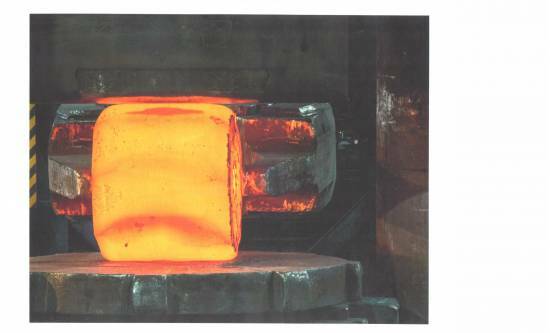 Due to the high head of the hydro scheme this method of manufacture will ensure that the runner is to the highest possible strength. The next stage will be for the runner to undergo rough machining and ultrasonic testing to identify any potential flaws. 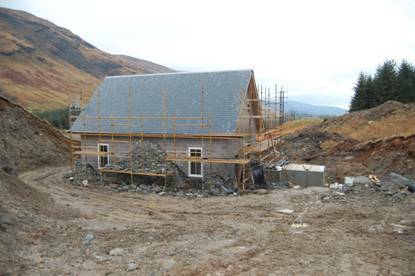 During October and into November work has progressed well in relation to the Hydro project. 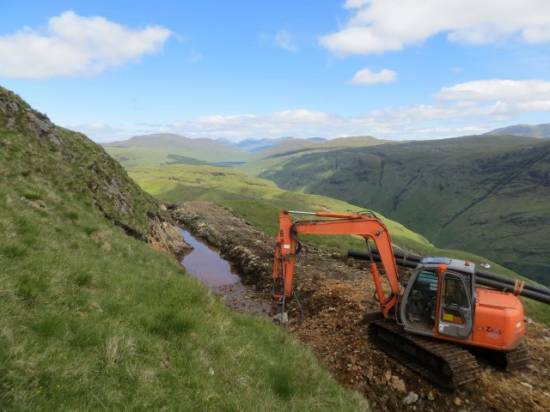 The formation of the North Leat section has progressed well along with the work to create the header pond area, which has mainly included excavation and earthworks. It is anticipated that concrete work to the header pond area will commence before the end of November, obviously weather dependant. Detailed design drawings have now been received from the turbine manufacturer which has enable work to now be planned and taken forward in relation to the foundations for the turbine house and associated site works. 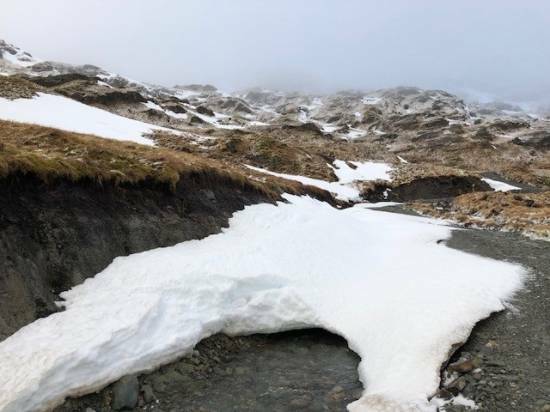 Early November has seen the first snow on the hill, which has since disappeared due to milder weather, however progress is pushing on to try and undertake as much groundwork at high level before the inevitable winter weather forces us to lower level. On Monday 9th September Roy kindly drove my family up the hill in his land rover. We were - my son Rahul, on holiday from his work in India, my daughter Tara and her son Finn (a digger enthusiast), we were lucky to have a magnificent day with perfect visibility. Rahul and Tara have heard me down in the dumps about the trials of the Merk Hydro (and the repercussions for Here We Are) for many, many years, so they were impressed to see the scheme at last unfolding on the hill side. As we looked across to the area of the secondary intake, we could just see sheep moving across the steep face of Ben Chas, and could hear an irate shepherd yelling at his dog. Then, up by the header pond, we met Alastair MaCallum who had been assisting the gathering in an argocat. Alastair, shepherd among these hills for 50 years knows every nook and cranie. He pointed out old badger sets and the nick in the rock caused by his father shooting a big dog fox. At the header pond Roy explained the entire scheme and then when we walked on along the north leat - with a spectacular view up to the head of Glen Fyne – he reported that he was encouraged with the construction progress. If they can reach the big burn, which is the first major burn of the Inverchorachan catchment area, before winter sets in, he will be well pleased. Rain held off ‘til we had just about finished our picnic on a promontory looking down Loch Fyne, even with a glimpse of Knapdale in the blue distance. What an afternoon. Construction on the Merk scheme is going ahead well. 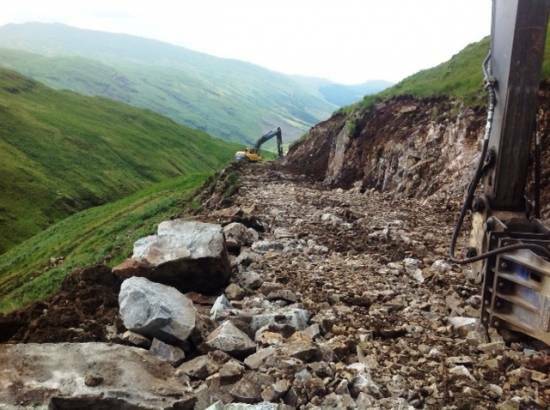 The good weather in July meant that MAM were able to get on with the access road. 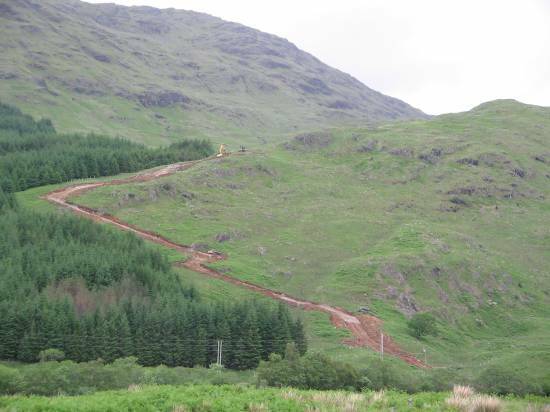 The initial, and very steep, early stage of this is visible from the village and the A83. They have now excavated the header pond, and are working on the high level leat system. A presentation on the current construction, estimated revenue and long term benefits for Here We Are and the community was made to the August Community Council meeting. 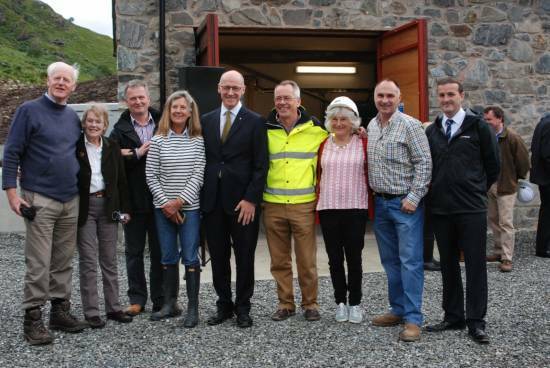 Mr John Swinney, Minister for Finance and Sustainable Growth called in on 27th August to catch up on Here We Are and the Merk Hydro. Construction is now underway on the lower sections of the pipeline and access track. 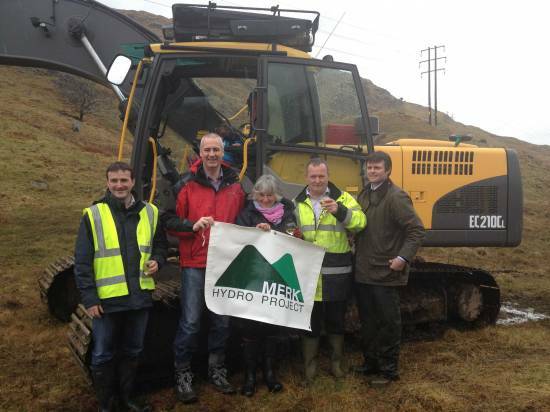 The members of the Merk Hydro Project and the local community gathered together today to mark a key milestone in the project - the turning of the first sod on the site. Construction is anticipated to last approximately 12-18 months and it is hoped that the scheme will be fully operational by Autumn 2014.